Yesterday I did not have the chance to visit Mebrats mother, so I return to Sembel Village to greet her. 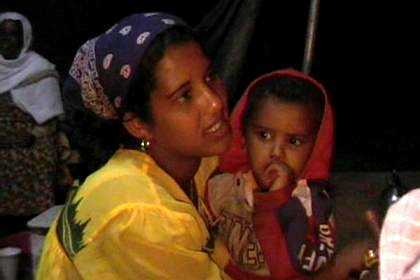 Feshaye will bring me to Kushet, a new village not far from Asmara (Space 2001). 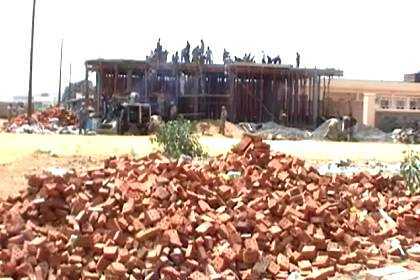 We walk through the village where workers are constructing houses, roads and other infra structure. We pass a house where women are preparing a wedding. We have to come in and try the suwa. It is the first time I can observe the production of this traditional drink. They bake bread until it is very dark, break it into pieces and leave it in water for seven days to ferment. I will try to make it myself when I am back in Holland. 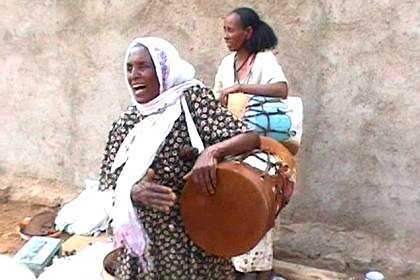 The women beat the drums and start to sing. I can visit the wedding if I want. I will be in Assab by that time. Going back from Kushet to Asmara is a bit of a problem. The mini buses are very very crowded and when it stops the people run for it. And there is no taxi to see. But I am lucky. When the next bus arrives, I can change places with the man in front. I feel guilty. People are actually giving up their nice position in the bus to please a tourist. From the last stop of the minibus near the Expo grounds, I walk to the Corea Housing Complex to collect the last packages that are left to be delivered. To save time and afraid the packages will be crushed in the crowded bus, I decide to take a taxi. As usual I ask the driver how much he will charge me. "You can make your own price." The answer comes quite unexpected. Should I refuse to take this taxi because the driver is not going to give me a fixed price. I decide to give him 30 Nakfa, whatever happens. It must be a good price. The driver is very friendly and helpful to deliver me at the correct address. I give the 30 Nakfa. No comments. It assume it is ok.
We drink tea with pastry and I make arrangements, so that the last package will be collected from this address. It is some medicines from Holland with just a name and a telephone number. I do not speak Tigrinya, so I leave it to the family here to make an appointment. Although I do not understand the conversation by phone, I am quite sure the medicine will reach their destination, just from the tone of the conversation. Everyone I meet is friendly, helpful and honest. All my worrying about these deliveries does not make any sense. I walk to the railway station. Want to make the trip by train to Massawa. From the manager I understand there is no time table. If I want to make the trip, I will have to charter the train, which will be quite expensive if I am the only passenger. I ask him if he can try to add me to any group that will charter the train during my stay in Eritrea and leave my telephone number. In the bar on the railway depot I have an egg burger and some drinks for lunch. On my way back to the center it starts to rain cats and dogs. I hurry into the first café I can find to wait until the rain stops. The streets of Asmara look like little rivers. The water is running rapidly to lower grounds. When the rain stops I resume my walk. Someone calls me back. "Sir, sir, you forgot your bag." I left the (now empty) bag I used to transport the packages in the café. In my home town it would be lost, but in Asmara the people make sure it is returned to the owner, if possible. I cannot go to the wedding with my dirty shoes, so I try find a shoe-shiner. Most of them are gone, because of the heavy rains. But I manage to find a little boy who is happy to have a customer. He does his very best to bring my shoes in a perfect condition. The price for the job usually is one or two Nakfa. I give him ten, to reward the fact that he is working for the money instead of begging. The wedding is in Kahawta. 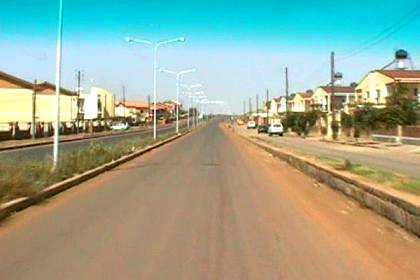 The road in this part of Asmara are rough and not easy to drive. We have to pay extra for the taxi. But with four adults and four children as passengers, we cannot expect to bargain a nice price. Feshaye makes a deal with the driver that he will come back at 23:00 to bring us back to Sembel. The best seat is reserved for the guest from Holland. I feel guilty. Very old men and women sit on small wooden stools. My offer to change places is refused. They even prepared special food for me with less chilly, which results in the moral obligation to eat it all. They did not have to do that, I am used to the Eritrean food. And I have to try the suwa. My wife always warned not to drink the suwa, because the way it is produced does not match our standards of hygiene. But I never had problems with it, so I drink suwa with the men. 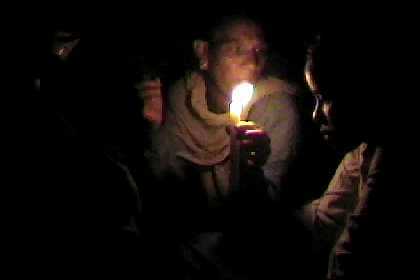 Just after eight a power failure in Kahawta results in complete darkness. Candles have to light the the tent for one hour. Fortunately electricity is back when the band arrives, and there is music and dance. At 23:00 sharp the taxi driver arrives, but Feshaye tries to convince him to wait and enjoy the festivities. He does. When he asks me why I do not dance I borrow some cloth from one of the women and dance with the crowd, using the cloth to stabilize the video camera against my body. Around midnight we go back to the house of Feshaye and Yordanos. They prepared the best bed for me in their small house, and they must sleep somewhere on the floor. During the night I am disturbed by all kinds of sounds on the roof. It must be either cats or birds, walking on the corrugated iron. The road to Kushet - passing another recent housing project. 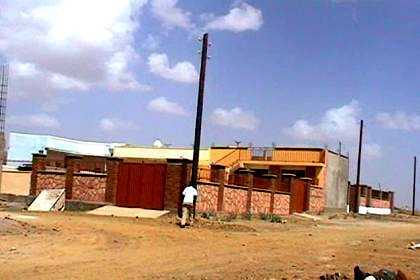 New build residential building - Kushet - Asmara Eritrea. Digging through the solid soil in Kushet - Asmara. 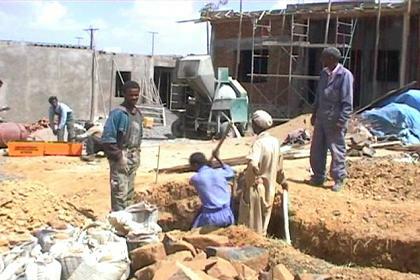 Construction activities in Kushet - Asmara. 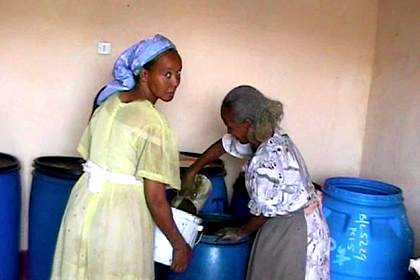 Women making suwa for the wedding in Kushet - Asmara. 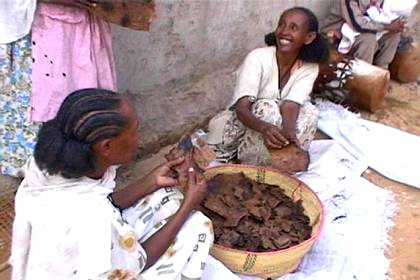 Women making suwa for the wedding in Kushet - Asmara . Women preparing for the wedding in Kushet - Asmara . Bisrat, youngest sister of Yordanos at the eve of the wedding in Kahawta. Power failure at the eve of the wedding in Kahawta. 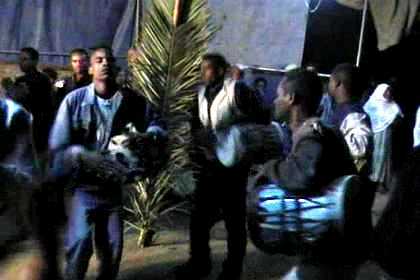 Dancing on the beat of the drums at the eve of the wedding.